The ladder bottom is a five-candle bullish reversal candlestick chart pattern that forms in a downtrend. On the first three days long black candles appear following each other in a descending line, like the three black crows pattern. The fourth day is an inverted hammer with short black body and long upper shadow. The fifth day is white and opens above the real body of the previous candle. What happens on the market? When the ladder bottom appears, the impetus of the downtrend slows down. On the fourth day the stock price reaches a new low and a reversal might be coming. This pattern forms scarcely and is not very reliable. A confirmation is necessary on the following days. 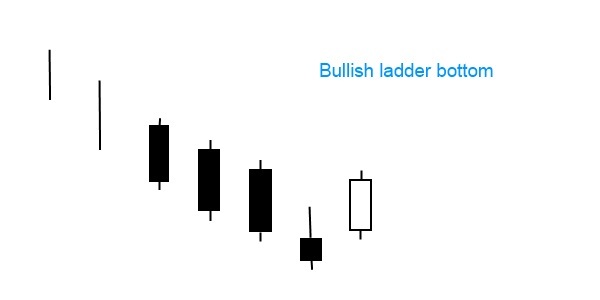 The ladder bottom pattern has a bearish variant: ladder top candlestick pattern that forms in an uptrend.